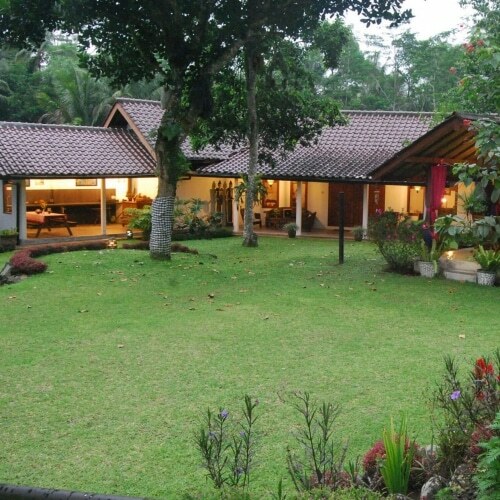 Our villa is located 21 km north of Yogyakarta, towards Kaliurang on the beautiful island of Java. 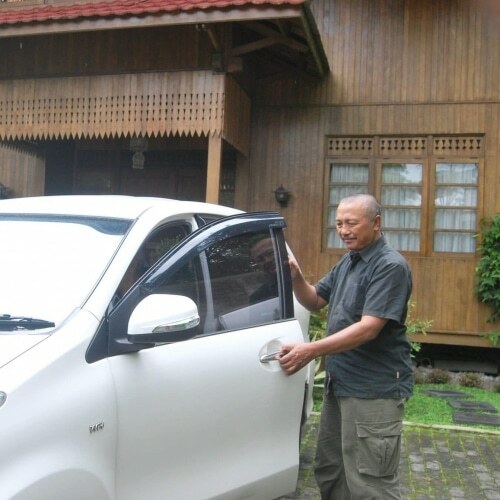 It is, from the airport and the station in Yogyakarta, more than half an hour drive to the villa. 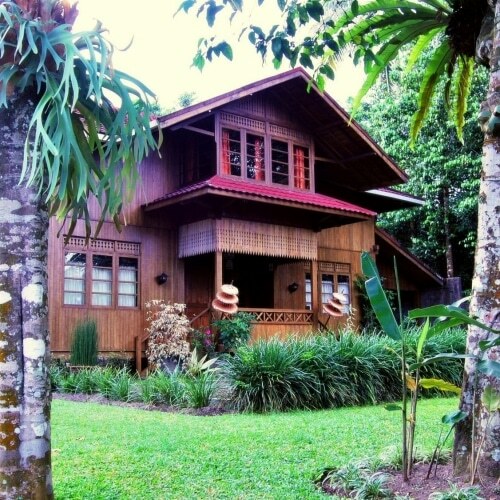 The villa is 850 meters above sea level, the climate is, therefore, more pleasant than in the city and there are much fewer mosquitoes and other insects. In the house, you can not smoke anywhere, in the garden and on the veranda that is no problem. Water from the tap is not suitable for drinking. There is sufficient safe drinking water in dispensers. In the living room, a refrigerator is partly filled with soft drinks and beer, you keep track of your own consumption and settle with your hostess. Power: 220 volts and Dutch sockets. Our site offers a lot of privacy and is completely walled. The swimming pool is not visible from the road. The villa has 6 bedrooms, an entrance, living room, a spacious loft, and a large veranda overlooking the pool and garden. 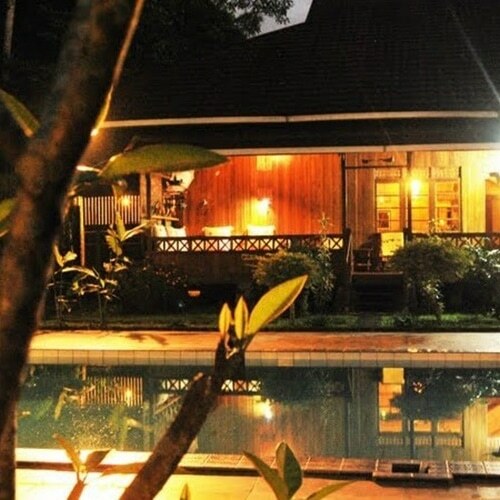 The villa is Javanese furnished and offers enough space for 12 people both inside and outside. There is free WiFi. There is a fridge, water dispensers and there is always enough coffee and tea for your use. The guest ladies like to cook for you and if you want to, you can check out the art. You can also use our studio for up to 2 people. Look here for more information. On the ground floor are 3 rooms, 2 rooms with a double bed and 1 room with 2 beds. 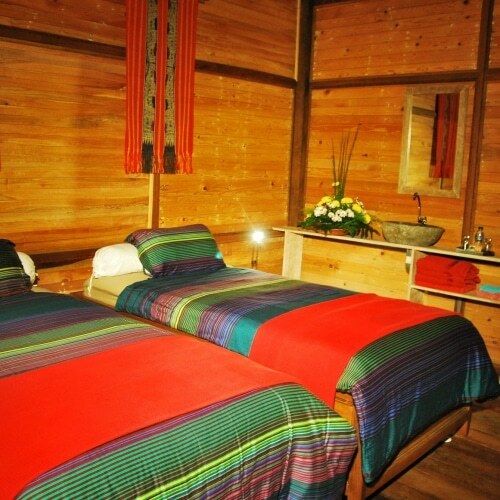 On the 1st floor are also 3 rooms, 1 room with a double bed and 2 rooms with 2 beds. The dimensions are 5 x 4.5 meters. 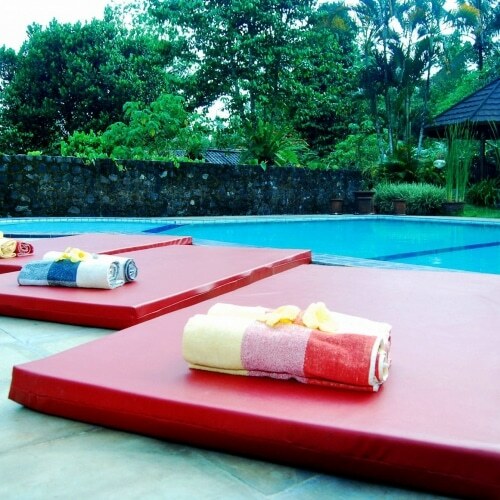 The spacious pool has a maximum depth of 2 meters and is cleaned daily. The villa is surrounded by a large tropical garden with many fruit trees including manga, salak, papaya, mangistan and jakefruit. The total area is 0.3 ha and is completely fenced. At the rear of the house, there is a cosy large veranda overlooking the pool and the garden. The permanent staff consists of 2 guest ladies and a host they live in their own house on the premises. They are responsible for your care, the villa, the pool and the garden. And for a fee, the ladies prepare your lunch and dinner. You will regularly see changing aids that help with various activities. Villa Tanen has a car and there is a large range of excursion possibilities. The car has air conditioning and is suitable for up to 10 people. Is transport needed for more people. this can be arranged. The rental includes driver-guide (and his food and drinks), fuel and parking fees. In Java, it is not advisable to drive yourself. Your stay includes breakfast (European or Indian), coffee, tea and water. Your guest ladies prepare lunch and dinner with complete devotion. Cooking skills can also be shared with you and you can also go to the market for groceries. You can cook yourself. There are several large supermarkets in Pakem and Yogyakarta. A masseuse, beautician and hairdresser can be arranged through the staff. Just like a photo session in original Javanese clothing. For more action the following is present: Golf sets, badminton, table tennis, basketball net, 2 good bikes and the pool. Walking is very possible in the area, the residents in Tanen are very friendly. Other activities such as bike rides, rafting, descending in a cave or a jeep safari on emissions of the Merapi volcano can be arranged on site. For more options, see the page excursions. 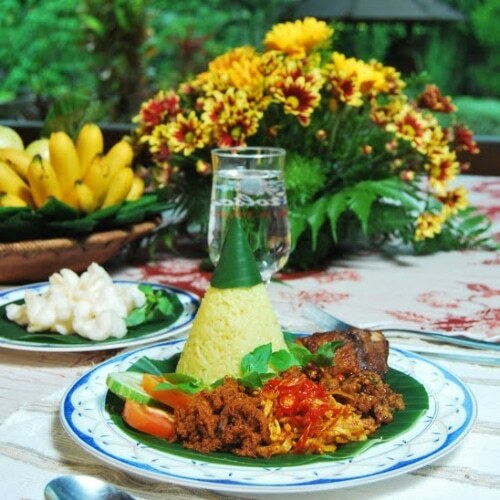 The location of Guesthouse Tanen is ideal for celebrating a wedding in Javanese style, organizing meetings and small conferences. 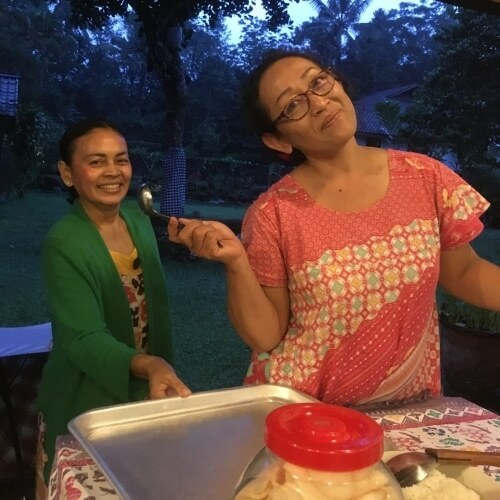 We can also provide workshops, for example a batik or cooking workshop.